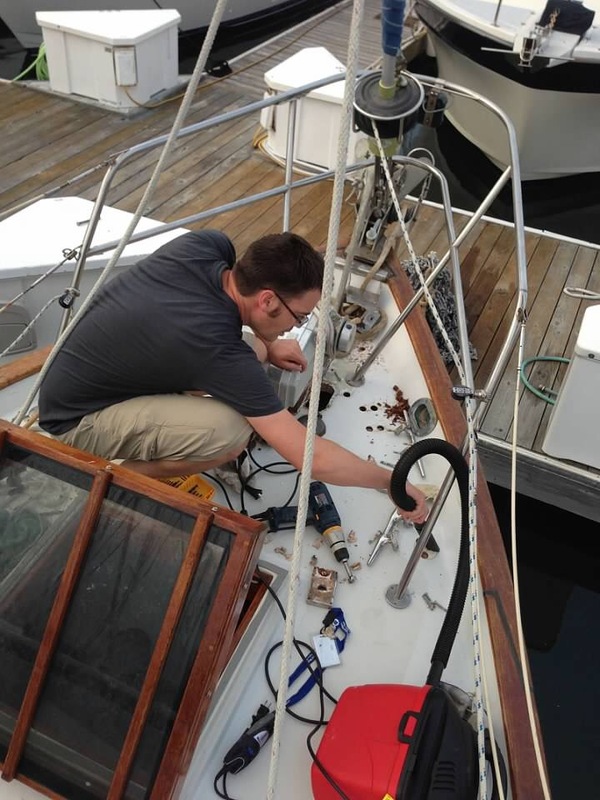 By the time we make it back to the marina, Andrew has pulled the broken chain plate up and through the deck, and he’s inspecting the jagged, rusted metal that is crumbling at the edges. He rigged up one of my halyards (ropes we use to pull up my sails) as a make-shift shroud, leading it to a deck cleat to give my mast a little more support. Once we are in calm waters and I am tied to my dock, the pain subsides and I no longer feel like my insides are going to tear themselves out. I huff and puff, grumble and grouse, but I don’t actually say any of this because I know they did their best. It wasn’t just Andrew and Leslie who didn’t see this problem. Their surveyor didn’t see it. They even hired a rigging surveyor and he didn’t see it either. The truth is, crevice corrosion happens on the side you cannot see – the side that is not exposed to oxygen. So at least until the crack makes it all the way through, the broken bit is attached directly to my hull and the outside looks soothingly fine. Stainless steel looks pretty until all of a sudden, it doesn’t. Once they have me secured and the support halyard in place, Andrew starts rummaging through my cabinets to gain access to all my chain plates. “If one looks like this, they must all look like this,” he says. Fear puddles in my bilge. What if they are so angry with me that they just want to sell me? Leslie gives me a pat on my mast, “Poor Sonrisa!” She says. I let out a small yowl of sadness. She pats my mast again. “Poor, poor Sonrisa! Don’t worry, we’ll get this all sorted out.” She may not be so magnanimous if she knew how I’ve behaved. I have no good excuse, it’s just been so long since I had been sailing. I love sailing! Andrew creates a web of support halyards, and systematically starts unbolting the chain plates he can easily access. One, two, three, four….with each one he pulls he growls. The magnitude of the problem increasing exponentially as he uncovers the truth. “Wow, Sonrisa, you’ve really been hanging on by a thread all this time.” Leslie says as she inspects the chain plates Andrew has pulled out. “Well, at least you waited until a day we didn’t have friends aboard to let loose.” She knows. She KNOWS!? How does she know? Now, crocodile tears plop in the marina pond below my hull. Leslie pats my mast again and gives me a hug. “It’s okay, we’ve all had so much fun sailing these last few months. Now, we can get serious about doing some refit work. We wanted to replace all your rigging anyway, now we know for sure its time.” I snuffle my nose and breathe, maybe it will be okay. They don’t seem too mad, at least Leslie isn’t too mad. Andrew is quiet. He’s going through his tasks without saying anything about anything. He spends Sunday morning gathering up my loose parts and pieces, presumably to see about sourcing new ones. As they leave, Leslie says “Hang in there, Sonrisa. We’ll be back with shiny new chain plates, soon.” Andrew, just leaves. I think he is mad at me. Over the next few weeks, Andrew researches more and more about chain plates. He reads article after article of information on which metals remain strongest after exposure to salt water. He tests the idea of titanium (Yes! I want new titanium chain plates! ), but he decides they are too expensive. (Nothing but the best for your girl?) He considers bronze and a few other fancy new age metals, but then Andrew finds he has “connections” as he calls them, and he knows a guy who can source 316 Stainless Steel and water jet cut them into shape like my old chain plates for a fraction of the cost. The first set lasted 32 years, that will be good, we’ll just replace them again before anything bad goes awry. Andrew decides to go that route and gets replacements made for all of my chain plates. Q: What else is Sonrisa not telling us? Q: What other life-supporting piece of her is dissolving into a sludge of metal and salt water? Q: What if something like this happens at sea? A: You are going to have to fix it. Q: How do I make sure something like this never happens at sea? In all seriousness, these are the right questions to ask of any boat, old or new. A very good Captain must know his ship inside and out; and he should approach things through a preventative lens. However, any ship can out run almost any Captain’s spending budget. Any Captain with anything less than an infinite budget must balance cost with pragmatism, safety versus aesthetics, repair versus simply replacing a problem with a wholly new part. People think circumnavigation dreams end when boats sink at sea. Sure, some do, but even more often dreams are snuffed in the outset when Captains find they cannot keep up with their boats demands for all-new bobbles. Though I didn’t intend to raise these questions in quite this way, I know these must be asked by a good Captain before he or she goes to sea. So, in a round-about way, this is just all part of Captain Andrew’s sea training! Yeah! That’s it, I’m giving him sea training. For the next few weeks, each time I see Andrew he remains in a foul mood. He doesn’t speak much, he says very little to me at all. Some of my chain plates are buried deeply behind my cabinetry. This means he has to dismantle whole sections of my interior to reach them. My roof panels are strewn about, wood pieces are unscrewed and taken apart. Everything is held on by thousands and thousands of little screws, some of which rust and fall apart in Andrew’s hands. He is sort of smiling, I know, but he does not seem happy. Soon, I look nothing like my former self – a construction zone of parts and pieces. Each time he opens a new area, he sees more to dislike: backing plates made of aluminum dissipating into dust, water intrusion in my deck core causing the wood beneath my cleats to disintegrate into a weak mush, rusted and cracking posts on my life line rails… What about the water tanks? What about the fuel tanks? What about the engine? What about the water maker? The rudder, the rigging, the steering…..the list is pretty endless. “I bought this boat because she seemed ‘ready to cruise’ she supposedly has everything we need. And yet, what of it can I trust?” He asks Leslie. Soon, Andrew’s project count fills multiple spreadsheets. “If you don’t want to know….don’t look!” I tell him. But, that is horrible advice that can get us all killed. He knows I’m just kidding. I would feel hurt, but I know what is bothering him. I can see it in his eyes: doubt. Doubt in me, sure, but even worse - he is doubting himself. “I know exactly nothing about fiberglass repair.” He tells me the day he opens the rotten area beneath my bow cleats (a metal hook on which you would attach the anchor rope or some of our storm gear if necessary). I say nothing in reply. What can I say? “Don’t worry! I’ll help!” Leslie says as she clutches a screwdriver and gives Andrew a cheerful fist in the air. At first Andrew is happy to have the help. He sets her upon fixing the sink which seems to be leaking around it’s edge. This created far more problems than it solved. “You have to wait for a minute.” He says. She holds her position, arms beginning to fall asleep, neck craned at an awkward angle. “Hurry, please!” At this point, he is forced to abandon his own project and run the gauntlet himself, clattering and banging, attempting to swing his preying mantis legs over cabinet blocks, ceiling panels, and old sink detritus. The ceiling panel falls off the bench again and gouges another nick in my floor. He helps Leslie get her sink plumbing secured, then sits back on the one patch of floor that isn’t covered in some mess or another.